We never can underestimate the power and influence of the people who cross our paths. In 2003, I met Todd Jones at American Marketing Systems Inc. when I was then a manager for the company. Todd was our AT & T Yellow Pages advertising representative and the responsibility had come to me to negotiate the contracts, and manage the content and placement of our ads. Relationships are not indicative of the context of Where, When, What or How we come together, but they are always indicative of the Why. Love is always the Why! Over the years, I got to know his beloved Tho Nguyen – who we share and totally value the love of flowers, food, & wine – and though my job, where I lived, and my circumstances changed, we stayed constant. Todd is one of those folks who will just not leave my story no matter what. We both have learned from each other about forgiveness, gratitude, and rolling with the changes. We roll with unconditional love, laughter, and the constancy that comes with the friendship story created over time. Tho and Todd are proud and happy to share their love story in this public forum. Cheers to you both! You are loved for sure! We are gathered here to join in holy marriage Tho Nguyen and Todd Jones bearing witness to the transforming power of love. Love is a miraculous gift. A wedding is a celebration of that magic light between a couple committed to keeping it shining bright for all to see. Love is a quality of spirit and an attitude of the emotions, and a marriage is a life’s work, a spiritual art form. Today is an occasion of profound joy and great responsibility. We who witness it, bind ourselves as to the labor of love that Tho and Todd are undertaking now and for their shared future. Let us take a moment of silence, to welcome and appreciate the unseen energy force that connects us to life here on Earth, what ever or how ever we name it. Today,here in this place, let us call it love. I ask you now, Tho and Todd, in the presence of your family and friends, To declare your intention to enter into union with one another. Tho, will you have Todd to be your husband? To live together in holy marriage? As long as you both shall love? 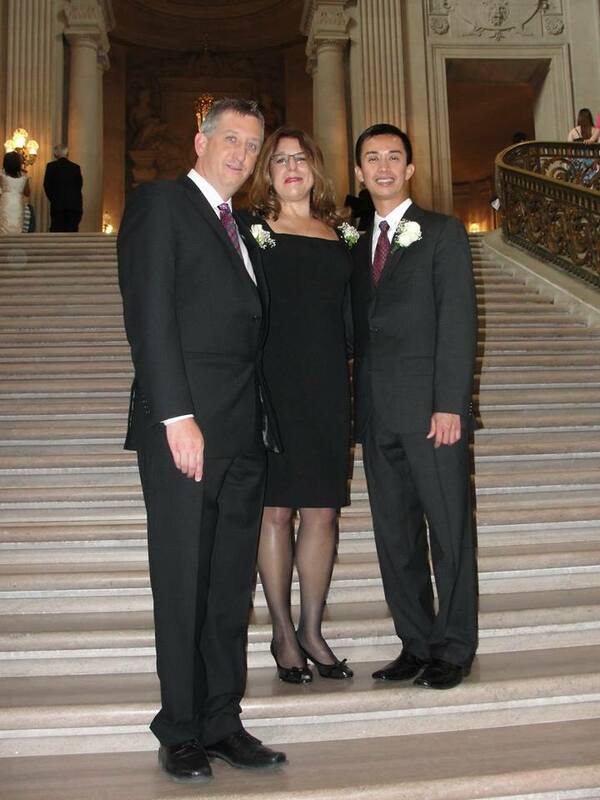 Sally: Congratulations Mr. and Mrs. Nguyen on the part you have played in raising a son, a brother, and an uncle of such love and purpose. On Tho’s behalf and on the behalf of all here, I thank you. I remind you that it is more than their blood that is joined here; it is yours as well. I ask your family to take Todd into their hearts as beloved to Tho. I ask your other children Tho’s brothers, sisters and their families, to receive Todd as their brother and uncle, for he is dear to Tho. So through the grace of Love, Todd deserves to be honored as apart of your family. Your vow, you speak for all. 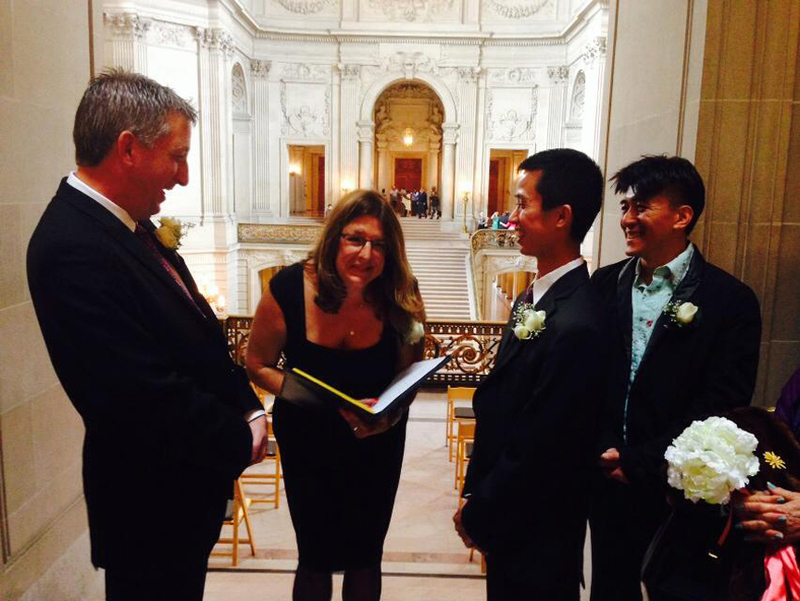 Sally: Mr. and Mrs. Nguyen will you vow this for the good of your new family? If so, please say…we do. Tho’s Mom & Dad: We do. Sally: Congratulations Mr. and Mrs. Jones on the part you have played in raising a son, brother, and uncle of such love and purpose. On Todd’s behalf and on the behalf of all here, I thank you. I remind you that it is more than their blood that is joined here; it is yours as well. I ask your family to take Tho into their hearts as beloved to Todd. I ask your son and his wife, and your extended family as well to receive Tho as their brother and uncle, for heis dear to Todd. So through the grace of Love, deserves to be honored as a part of your family. Sally: Mr. and Mrs. Jones will you vow this for the good of your new family? If so, please answer with we do. Todd’s Mom & Dad: We do. Sally: Ken & Paul, Tho and Todd have chosen you as their best men, to stand next to them with unconditional support for the promise they are making today. Marriage is a courageous act of love for another. Do you vow to remind them, when they need to be, that this was their vow to each other to serve and protect this love? If so, please answer with, we do. Sally: Will all of you as family and friends to Tho & Todd’s hearts, by Love’s grace, do everything in your power to uphold and care for them in their marriage, to celebrate with them all of life’s gifts and challenges, and to love them unconditionally? If so, please answer with we do. As marriage is a spiritual commitment, made visible today by our ceremony, and the documentation through the civil rights of our society, we ask you both to proclaim your vows to each other, in this public place, with us as your compassionate witnesses to what is the song in both of your hearts that you sing together. The vows that you have chosen reflect the unseen and intangible lyrics of your hearts that resonate as one. May the devotion you promise today,forever show the power of love made manifest, and the joy of dreams come true. Todd: I vow to love you Tho with the greatest freedom possible, that your soul not be bound by my choices, judgments,expectations, but allowed to soar with the safety and sanctuary of my heart so where ever you go, I will be there too. Tho:I vow to love you Todd with the greatest freedom possible, that your soul not be bound by my choices, judgments, expectations, but allowed to soar with the safety and sanctuary of my heart so where ever you go, I will be there too. Todd: Tho I vow to create a family with you that is unique and represents what we value: entertaining who we love, traveling and adventuring this beautiful world, and shows our ancestors that walk in front and behind us, that love has no limits and is guided by honor, truth, respect and kindness. Tho: Todd I vow to create a family with you that is unique and represents what we value: entertaining who we love, traveling and adventuring this beautiful world, and shows our ancestors that walk in front and behind us, that love has no limits and is guided by honor, truth, respect and kindness. Todd: Tho I vow to lovingly encourage you to be your Greatest Self. I vow to remind you your creativity knows no limits. I will celebrate you as the Artist you are. Tho: Todd I vow to lovingly encourage you to be your Greatest Self. I vow to remind you your creativity knows no limits. I will celebrate you as the Artist you are. Sally: Blessings Be! And, so it is! Sally: If there is any thing more you wish to say to each other, now is the time. Please know that if you choose to remain silent, that silence is enough. In fact, silence is more than enough for in the quiet and the still, loves potential rests. When we have the ability to say nothing, and be comfortable, our souls are at home with each other. That is love. Tho and Todd: At this moment, no words were spoken by either. They just looked with love at each with Love. Sally: Will the ring bearers, Ken and Paul, come forward? As Love is a circle whose center is everywhere and whose circumference is nowhere,so let the seamless circle of these rings become the symbol of your endless love. These rings are the outward and visible sign of an inward and spiritual grace; signifying to you, and the world, you’re union, and the pledge of your devotion to your beloved. The circle is the symbol of the sun and the earth and the universe. It is a symbol of holiness, of perfection, and peace. Life is the sacred marriage of heaven and earth, our souls with our bodies. In these rings,the circle is the symbol of unity, in which your two lives are now joined in one unbroken circle of which, wherever you go, you will always return to one another and to your one heart. May these rings be blessed with the affection of this unity. May you find in each other the love for which all yearn. May you grow together in understanding and compassion. May the home, which you establish together with your authentic selves, be such a place of sanctuary that many will find there a friend. May these rings on Tho and Todd’s fingers, symbolize the touch of the spirit of love in all hearts. And with all that I am, and all that I have, I celebrate you. May it be the symbol that we have chosen to serve one another in perfect freedom. May it be the public demonstration that our love is complete and never ending. It is you, Tho, whom I am choosing always to encircle with my love. I am honored to call you my Husband. It is you, Todd, whom I am choosing always to encircle with my love. Now that you, Tho, and you, Todd, have promised to give yourselves to one another and to love each other through your sacred vows and through the giving and receiving of these rings, I now, by the power vested in me by the State of California,I pronounce you Husband and Husband. Those whom Love has joined together may they be generously blessed forever. You may now kiss. Now you will feel no cold. For now there is no more alone.